There are two amazing things about this video. 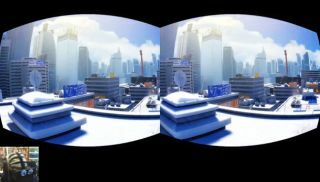 The first is what its showing: DICE's first-person freerunner Mirror's Edge running (mostly) smoothly in the Oculus Rift. The second is the reaction cam, and the chance to see someone responding to a VR playthrough of a game that heavily features head-twisting balance challenges and running face first into a wall. Okay, three amazing things. Those googly eyes should be an out-of-the-box feature. Video maker Cymatic Bruce was able to play the game through the Rift using the open-source Vireio Perception driver, which also supports a variety of Source games, Skyrim and Dejobaan's AaaaaAAaaaAAAaaAAAAaAAAAA!!! Which is probably an appropriate name when played through a VR headset.